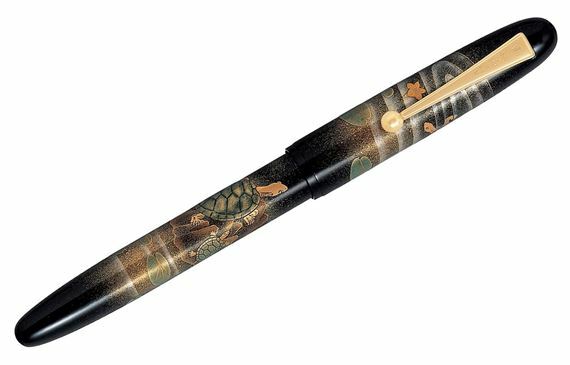 Order your Namiki Yukari Collection Maki-E Turtle Fountain Pen today from FahrneysPens.com. Fine Pens, Refills & Luxurious Gifts – great prices & fast shipping. The Yukari Collection from Namiki transforms traditional scenes from nature into striking fantasies. The Turtle design features the beauty of Togidashi and Taka Maki-e in intricate raised relief form, beautifully executed in pigments and gold flake on black urushi lacquer. This motif places the turtles in a pond with lily pads, fallen leaves and splash ripples, all traditional subjects of Japanese painting. The Turtle is a symbol of prosperity and longevity, immortalized in Japanese folklore as the bringer of wealth and the fulfiller of dreams. A must for fountain pen enthusiasts, the Yukari Maki-es come with an 18K gold nib and 18K gold clip. A traditional Japanese wood gift box with bottled ink completes the striking presentation.